After cutting of the tree remains a tree stump, which usually spoils the view of garden. 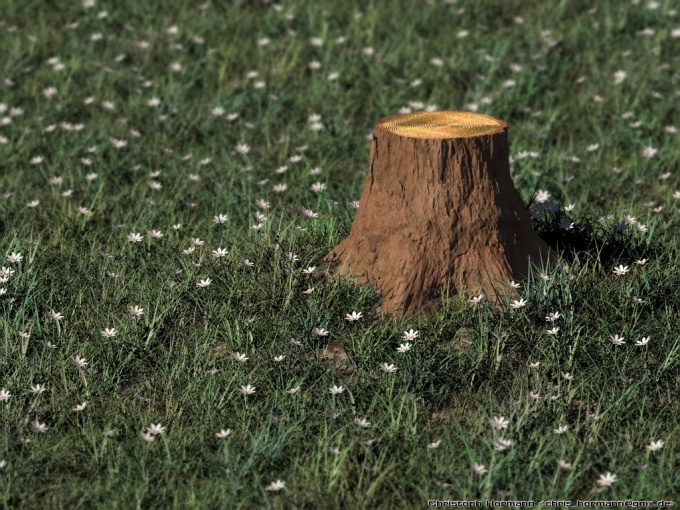 In some cases, stumps can be used for decorative purposes, but usually they have to get rid of. There are several ways to remove the stump from the area, which vary in time, labor and financial costs. To remove the stump of the tree is possible by chemical means. On the cut, drill a hole, pour in it the sodium or potassium nitrate. Cover the stump with film that the rain washed away her. To speed up the process of removing the stump of the nitrate by making a concentrated solution and continuously pouring it into the stump for a long time. When heated, the nitrate releases oxygen. So when a stump the whole impregnated with saltpeter and dried, it is ignited. Thus, the stump is completely burned, even the part that is in the ground. The way to remove a stump nitrate cannot be used if the garden plot is located on peat soils. This can lead to ignition of the peat, which is difficult to extinguish. In this case, sprinkle the stump with coarse salt. The salt has impregnated it, destroying the wood. In a year the stump will rot, but the soil may be affected do not use this method if the area where the stumpwill be used for growing plants. Remove stump salt can only rashidinia of the site for construction. Much faster and more efficiently to solve the task of removing the stump by mechanical means. The fastest and easiest method to order a special machine for cutting stumps. In a few minutes the stump will turn into a pile of slivers. Typically, these machines have horticultural societies, where to go to for a modest fee to remove a stump. You can also order the services of special companies, who are using professional tools, winches, anchor drill, jacks, and other equipment will remove the stump. If you don't want to spend the money to remove the stump, you try to uproot yourself. Dig with a spade the earth around, making a circle with a diameter of not more than five feet. A strong jet of water to dilute the ground to show roots. A sharp handsaw, make two cut, removing the cut stump to 10 cm. Start rocking the stump, for this purpose you can use the crowbar as a lever. If the goal is removal of the stump to prevent the emergence of shoots from it, then cutting it very close to the ground. Drill, drill several holes around the circumference of the stump, through the funnel pour into them the solution of any oxidizing substance such as ammonium sulfate. The holes will close up with clay. Acid will get into the wood, preventing the emergence of shoots. Remote stump is of no value. Sometimes you can use unusual stumps with artfully twisted roots for decorative purposes.